Is used tissue paper “dry garbage” or “wet garbage”? Which type of trash does hair belong to? Those are just two of the many questions that had initially confused Qi Daolun since her neighborhood adopted a trash-sorting program in April. But the 84-year-old now claims to be an expert when it comes to separating her garbage. “I didn’t use to take trash sorting seriously, but now I realize it is a good thing and everyone should be doing it,”tiny said Qi, who lives with her husband and son in a neighborhood of retired cadres in the Chengjiaqiao subdistrict of Changning district. Presently, 27 neighborhoods in Chengjiaqiao have adopted a trash sorting program. Qi picked up the knowledge of sorting her trash through lectures in the neighborhood that were conducted by social workers, volunteers and officials of the neighborhood committee. Among the officials was Lin Jing, who had earlier this year handed out trash bins that come with separate compartments for dry and wet waste. When the trash sorting program was launched in April, Lin had to visit the trash station every day to ensure that people discarded their rubbish correctly into the four bins ― dry garbage, wet garbage such as food, recyclables, and hazardous waste such as batteries and electronics. To help residents learn better, Lin instructed people to use different bags for different type of trash. She also made each resident review the contents of these bags. “It was a lot of work at first, but this is the most effective way to teach people how to sort their rubbish,” she said. Three months later, Lin no longer had to make daily visits to the trash station as the practices had already become second nature. Even the neighborhood’s security guard has become a volunteer, helping open the trash station during the designated hours ― 7:30-9:30 am and 4:30-7:00 pm ― when residents can discard their garbage. Waste disposal trucks also collect the trash during these time windows. The Shanghai municipal government in March released a plan to sort household waste. According to the action plan, all districts in Shanghai would have trash sorting programs by 2020. The plan aims to reduce daily dry waste output from 21,400 metric tons to 18,100 metric tons, while increasing the output of wet waste and recyclables. Wet waste would be used to create compost or fertilizer. According to Liu Chang, deputy chief engineer at the Environmental Sanitation Engineering Technology Research Center of the Ministry of Housing and Urban-Rural Development, the main solid waste disposal methods in China are still landfills and incineration plants. As such, properly sorted trash can reduce the footprint of landfills and improve efficiency at incineration facilities. “The amount of household waste produced in China has been increasing every year, and the solid waste treatment industry has been developing at a high speed as well,” Liu said. A new round of trash sorting efforts has been implemented across Shanghai since August. New versions of pamphlets and brochures about trash sorting have been printed and distributed. Teams of volunteers, including university students and retirees, gathered in August to instruct residents about garbage classification, according to the municipal volunteer association. A trash sorting themed day, which takes place on the fifth day of every month starting in September, has been introduced as well. Authorities have also leveraged technology to further promote trash sorting. 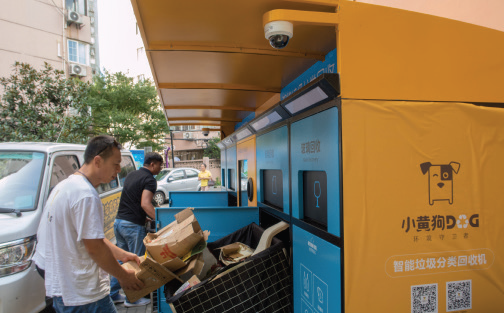 At a pilot trash station, smart recycle bins equipped with sensors can identify the type of items discarded before dispensing a monetary remuneration for users. The smart bin can also notify the trash recycle company when it is close to maximum capacity. New supervision systems are being tested as well. In Fengxian district, Party members and local officials have each been assigned with a specific trash station to take charge of. Trash sorting is not a novel effort in China. In 2000, Shanghai was selected as one of the eight pilot cities to implement such efforts. Last year, city authorities also introduced a rule stipulating that workspaces, including those at government bodies and enterprises, are required to sort their waste. According to the Shanghai Municipal Administration of Afforestation and City Appearance, whose main task includes waste transportation and treatment, 50,000 offices in the city were notified of the rule last year. Administrators of most office buildings have complied by changing their trash bins and putting up notices in their lobbies. Liu Peng, who works at an advertising company, said that his office building on Huaihai Road has since replaced the original bin with a larger one that comes with three compartments. Despite the various measures taken in Shanghai in recent years, not everyone has adhered to the regulations. There were 557 cases of non-compliance which resulted in a combined total of 20,000 yuan ($2,917) in fines last year. Michael Rosenthal, a US citizen who is the founder of a waste treatment company, said the key to improving trash sorting lies in setting standardized regulations and leveraging technology. He also lauded how most Chinese have quickly embraced the new regulations. “To see green practice becoming more common in China, and people’s behavior changing within a few years is truly an amazing thing,” he said. Qi, however, pointed out that it is all a matter of will. “This has got to do with people’s mindsets. All they need to do is just lift a finger and it’s done. So why not do the right thing?” she said.